It’s been a few months since I have participated in The Secret Recipe Club, and it’s good to be back! This month I was thrilled to be assigned Lesa’s blog, Edesia’s Notebook. Lesa, who started her blog in 2007, is a stay at home mom of two seriously adorable girls, and promises simple meals fit for weeknights. So many of her enticing recipes caught my eye, from the summer vegetable frittata (you know how I feel about those) to the homemade chipotle ketchup (which would be perfect with these). And then there was this mango barbecue sauce, which would be the perfect fix for my current mango addiction. But it was the zucchini that eventually won out. I was between her baked zucchini fries, chicken zucchini burgers, and the one pot summer squash, beef, and rice skillet. I guess you know which one I eventually chose. And what a good choice it was! Seriously I could eat these every day and be happy. Edesia’s recipe is simple and so doable, and I made just a few minor changes. I added 1/2 cup grated Parmesan because, well, Parmesan makes everything better. I’m sure they’re amazing without the cheese, but with it they are downright addictive. I also used a little seltzer in the egg batter, which is a trick I use to make any kind of breading a little lighter. Seriously, try it next time you make tempura or fish and chips! I loved the little kick that the fries got from the hot paprika, and was impressed with how crispy they got in the oven. My husband and I gobbled them up in about three minutes flat. 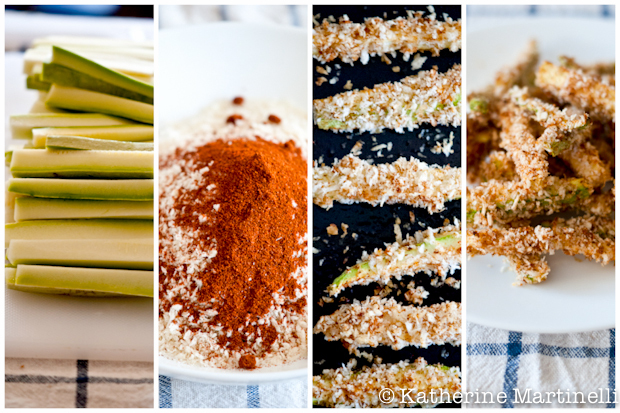 These zucchini fries are fast and easy to make and are super kid friendly. Plus, they’re way healthier than regular French fries! Thanks Lesa for the recipe inspiration! These baked zucchini fries crisp up beautifully in the oven and are downright addictive. Perfect as a snack or a side, and super kid-friendly. Preheat oven to 400F. Lightly grease a baking sheet with cooking spray or oil. Put panko breadcrumbs, Parmesan, salt and paprika in a shallow bowl and mix to combine. In a separate shallow bowl, whisk eggs with seltzer. Dip each zucchini piece in egg then breadcrumb mixture and put on prepared baking sheet. Lightly spray the tops of the zucchini fries with the cooking spray. Bake for 20 to 25 minutes, until crispy on all sides. Great choice, Katherine! I’m glad you liked them! These look wonderful! We love zucchini fries here. Zucchini fries are on the mind of many Secret Recipe Club members this month! We love these things around here, but I cannot wait to try this recipe: the use of seltzer is so intriguing! I cooked from your blog this month and made the graham crackers. They were delicious! I thoroughly enjoyed perusing your gorgeous site and will be back often. Everything is better with parmesan! Love these fries! Oh, wow–fabulous idea. I’m going to try it and pass this along to my friends who have zucchini up the wazoo coming out of their gardens. Brilliant. These are so delicious – I make something like this for us a lot in the Fall. They look like they turned out fabulous! Great photos! 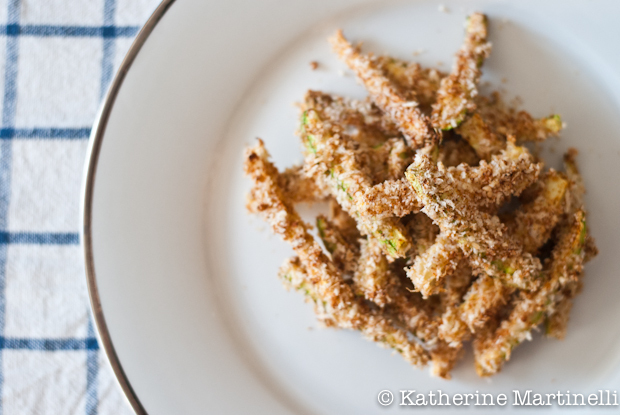 Zucchini fries are one of my all time favorite treats! These look light and tasty. These look fabulous! I’ve been meaning to try baked zucchini fries and I’m now convinced that I have to while I can still get nice zucchini! Great choice for SRC!! These look a lot healthier than the zucchini fries I’ve eaten before! However, they look better! What a great snack! Great way to use up all of that end-of-summer zucchini! Who doesn’t like anything that’s made into “fries?” And baking is so much healthier than frying. Good stuff – thanks. These really turned out well, K! Baked fries are surely the way to go and these look exceptionally tasty. Very cool, healthy fries with zucchini. Love the idea and could play with the spicing too. LOVE zucchini fries but have never had them baked. Thanks for this one. Pingback: 15 Healthy Game Day Snacks - Skinny Ms.